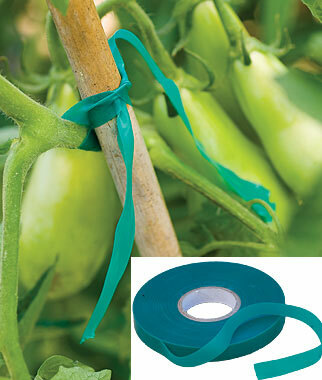 The perfect tomato staking tape is versatile enough to use with tomato cages, tomato stakes, or a tomato trellis. Poles, posts, sticks, cages – all these types of tomato staking provide support. But tomato plants are notorious for growing strong and fast, producing dozens of suckers and branches. You need to tie large branches to the stakes or sides of the cages so they don’t break off. All kinds of twining materials can serve as tomato ties, including string, fishing line, plastic cable ties, garden clips, and strips of fabric. But at Tomato Dirt we have discovered the perfect tomato tie. Stretch ties are awesome tomato ties. Gardening retailers market gardening tape at reasonable prices. Roll flagging tape, the generic version, is a colored non-adhesive tape used in marking objects, such as trees to be logged, boundaries to be surveyed, or patients to be treated in a triage mass casualty disaster. Like gardening tape and gardening ties, most roll flagging tape is made of vinyl. It’s available at most discount department stores, home improvement stores, and of course on the internet. It’s long. The tape comes on a roll – one of its biggest advantages. You can spool out a length as long as you need to reach those long, renegade tomato branches and rein them into the cage or stake. You can even encircle an entire plant or weave the tape in and out of branches before tying it off. Other purchased garden ties are pre-cut. They’re often not long enough to stretch out and accommodate branches. It’s moisture-resistant. The vinyl allows moisture to roll off the flagging tape/tomato ties, discouraging mildew, a feature especially appreciated by gardeners who work relentlessly to prevent diseases. It’s strong. Vinyl content makes the tape strong enough to last a full season even when exposed to full sun for weeks and weeks. Yet stretches without strangling or breaking branches. Give stretch ties / flagging tape a try. Let us know how this tomato tie option works for you by sharing your comments below. Review: Tomato cages from Gardener's Supply ..